The Highlander family SUV for those who don’t want a family minivan. 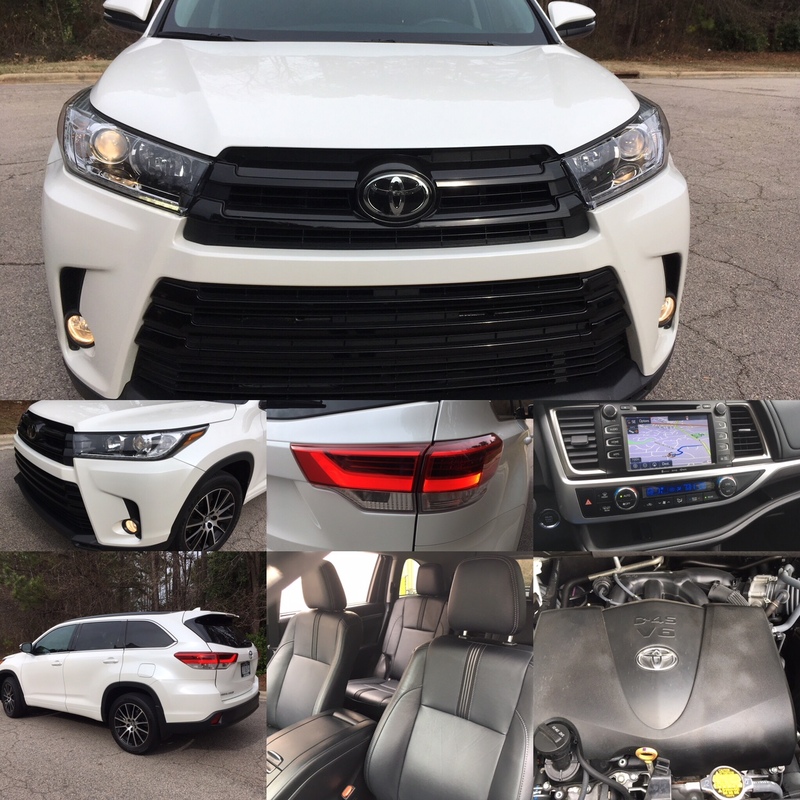 2018 Toyota Highlander SE with all-wheel drive. Midsize, three-row sport utility vehicles are the conveyance of choice for millions of American families. Indeed, in large part, SUVs have supplanted minivans in the people-carrying department, which itself displaced station wagons from an earlier era. Toyota, however, takes a two-prong approach when serving most larger families, by supplying the Highlander SUV and the Sienna minivan. The two are similar in size and both offer available all-wheel drive, with the Sienna the only minivan model offering that option. 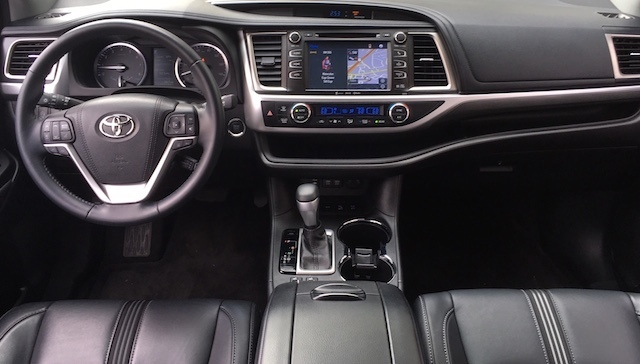 The 2018 Toyota Highlander seats eight or seven with the available center row captain’s chairs. The current-generation model rolled out in 2014, so we’re now looking at its fifth model year. Happily, Toyota has kept this model fresh through regular updates. Among the most recent and noteworthy changes is an updated front fascia, expanded driver-assist safety features and a more powerful V6 engine. You can shop the 2018 Toyota Highlander in six trims: LE, LE Plus, XLE, SE, Limited and Limited Platinum. Only the base LE model with front-wheel drive offers the 2.7-liter four-cylinder engine making 185 horsepower and 184 pound-feet of torque. Essentially, it is the “bookmark” engine for this model — certainly, you won’t want to consider it if you regularly carry a full load or tow (it has a 1,500-pound tow rating). Toyota pairs this engine with a six-speed automatic transmission. The engine you’ll find in nearly every new 2018 Highlander on dealer lots is a 3.5-liter V6. Like the four-cylinder, this particular displacement is familiar to Toyota fans. Unlike the base engine, the V6 is new and now makes 295 horsepower and 263 pound-feet of torque. It works with an eight-speed automatic transmission and supplies a 5,000-pound towing limit. Importantly, it is just as efficient as the base engine, while delivering the performance and utility you want. So, if I haven’t convinced you yet to avoid the base engine, consider the point already made. Most press fleet vehicles are top-trim or near top-trim models. It isn’t too often that journalists review base models or anything close to it. 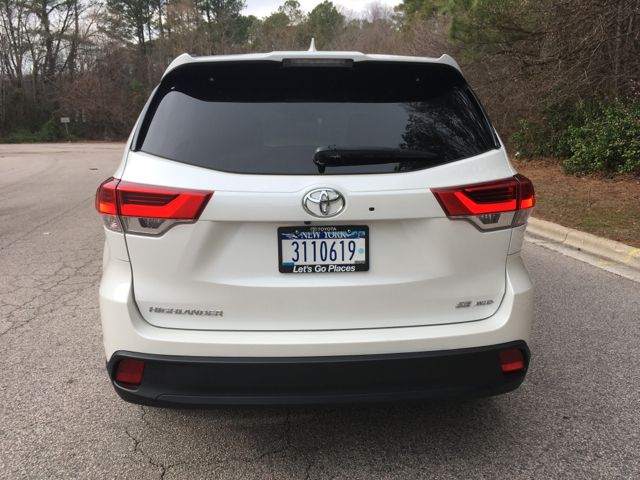 My test Highlander SE falls closer to the middle, delivering the amenities most customers want without all the bells and whistles nor the near $50,000 price tag of a fully optioned Highlander. To be sure, the fully optioned Sienna parallels the Highlander in price, but the significant difference with the minivan is its sliding rear doors and more storage compartments/options than the SUV. If you start your search with the base engine, you’ll find such equipment as halogen headlights, daytime running lights, LED rear lights, heated and power-controlled side mirrors with turn signal indicators, 18-inch alloy wheels, front and rear mudguards on all-wheel drive models, and a rear spoiler. Toyota prices the base model from $31,030, plus $995 destination. Add $2,050 for the V6 engine and another $1,460 for all-wheel drive. Inside, seating is for eight with full power accessories, a tilt-and-telescopic steering column, cloth-covered seats, front and rear air conditioning, eight cup holders and four drink holders, an overhead console, cargo tie-down hooks and cargo area lights standard. The open storage area running across the bottom of the dashboard on the passenger side is one my favorite features for its usability. In particular, that space is ideal for holding and connecting cell phones, squirreling away such children’s items as stuffed animals and figurines or even holding snack items. Between the front seats is another nifty storage compartment, large and deep enough to hold a few dozen drinks along with ice (there’s a drain plug for releasing water). 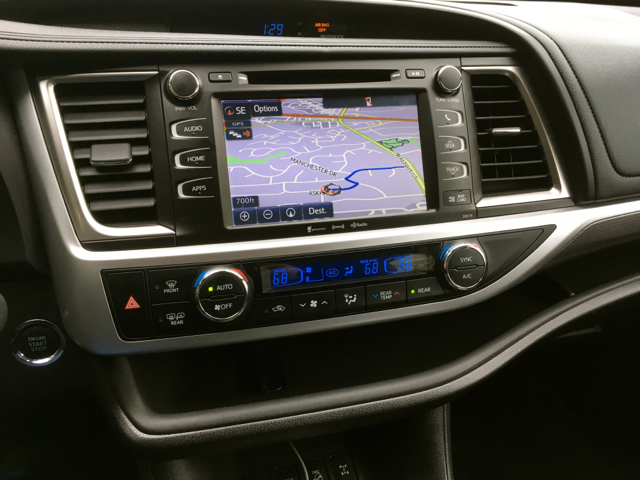 On the tech front, you’ll find a 6.1-inch touch-screen display with a rearview camera, a six-speaker audio system, a CD player, Siri Eyes Free, Bluetooth connectivity, auxiliary audio input and five USB ports. Safety features include Toyota Safety Sense P (TSS-P), comprised of a pre-collision system with pedestrian detection, automatic high beams, lane departure alert with steering assist, and adaptive cruise control with a full stop. That’s quite a long list of standard equipment, right? Still, even if you decide for the base model, upgrading to the available V6 engine is the right move. If you prefer better-equipped models, here’s what the other five trims offer. Prices do not include destination and are based on front-wheel drive versions. Toyota markets a Highlander Hybrid model separately. Highlander LE Plus ($35,460) — The LE plus delivers integrated fog lights, upgraded 18-inch alloy wheels, a flip-up hatch rear window and a height-adjustable power liftgate. This trim also gains three-zone climate control, imitated leather first- and second-row seats, a leather-wrapped steering wheel satellite radio, HD Radio and Scout GPS for navigation. Highlander XLE ($38,920) — The XLE brings in a power tilt-and-slide moonroof with sunshade, chrome-like roof rails, and blind spot warning indicators to the side mirrors. Inside, the second-row captain’s chairs replace the middle row bench seat and you’ll find imitation leather seats across all three rows. Other changes include upgraded interior trim, a digitally enhanced instrument panel, second-row sunshades and a 120-volt outlet. This trim also adds an App Suite, an anti-theft system and blind-spot monitor with rear cross-traffic alert. Highlander SE ($40,090) — The XLE and SE are similarly equipped with the SE offering a sportier look and drive. The SE offers LED daytime running lights, 19-inch alloy wheels with a black finish, and dark painted upper and lower grilles and roof rails. Inside, you’ll find black leather-trimmed seats and blue ambient lighting. The SE is also the only trim to offer Salsa Red paint and seven-passenger seating only. Highlander Limited ($42,080) — As one of two top trims, the Highlander Limited pulls out all the stops. Here, you’ll find puddle lamps, special 19-inch Chromtec wheels, power front seats with driver lumbar support, heated and ventilated front seats, a rear cargo area tonneau cover, a 12-speaker JBL audio system and rear parking assist. Highlander Limited Platinum ($45,200) — Toyota treats the Limited Platinum as a trim, but it is also a package that adds a layer to the Limited edition. Here, you’ll find a panoramic moonroof with a power sunshade, a special 19-inch wheel design, a heated steering wheel and heated second-row captain’s chairs and a bird’s eye view camera. This model also gains front parking assist. As you might expect, the 2018 Highlander comes with packages, but not too many as most add-ons come with the respective trim upgrade. 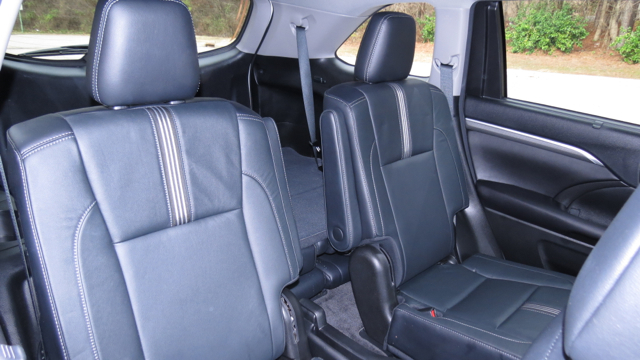 The XLE, Limited and Limited Platinum trims offer an available eight-passenger arrangement by substituting the second-row captains chairs with a bench seat. You’ll also find rear-seat Blu-Ray DVD entertainment with a nine-inch screen and two wireless headphones in the XLE, SE and Limited trims. 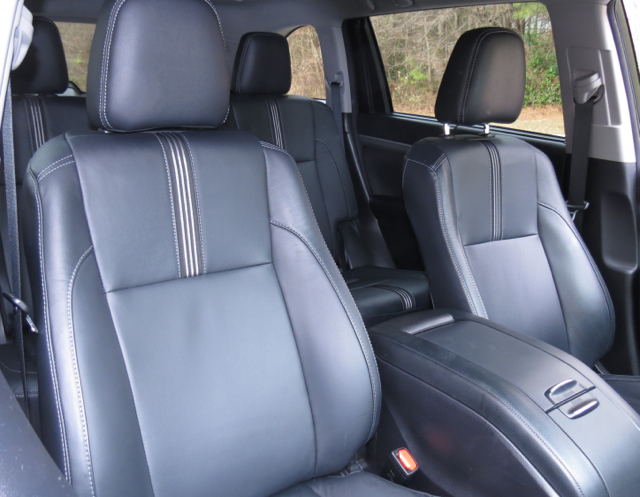 The Limited offers a seat package with leather seats and other upgrades, a package that includes heated outboard seats with the Limited Platinum. 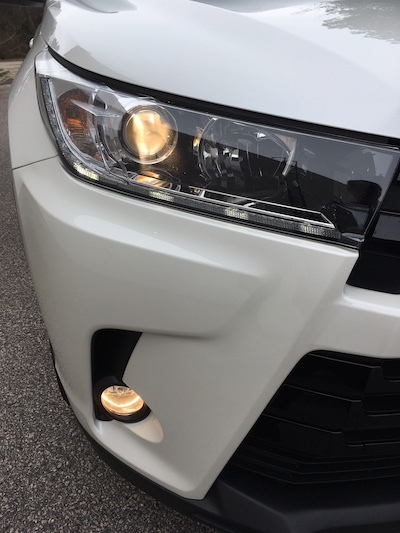 Besides any one of the seven standard exterior colors, customers may upgrade to Blizzard Pearl ($395) across all trims, the same color used in my test model. If you’re looking for Apple CarPlay or Android Auto smartphone compatibility, neither is available. Toyota has been very hesitant to give third-party access to its systems, although we’re beginning to see that policy relaxed, at least in some models, but only with Apple. At least thus far. And as far as downloading and using the Scout GPS app for navigation, it is wonky at best. I know this because my wife has been battling it with her 2017 RAV4. She finds it spotty and frustrating, and uses her smartphone directly to provide directions. 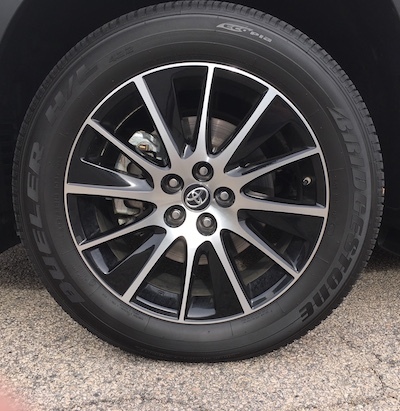 One more point about the 2018 Highlander worth noting: in addition to the standard warranties, all models come with Toyota Care, a complimentary maintenance program covering such things as tire rotation, fluid top off and oil changes. 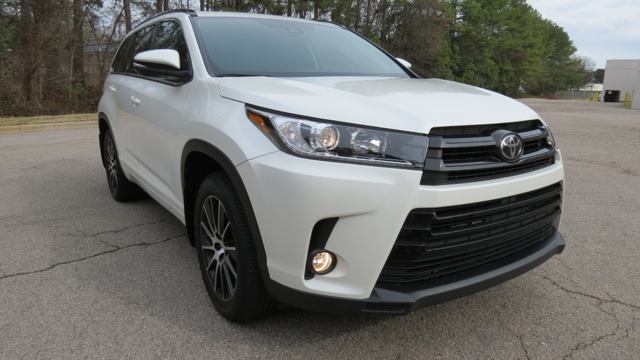 Head out with a V6-equipped Highlander and you’ll have nearly 300 horses delivering full power. My trips were mainly solo affairs, but I can say that even under a full load, the V6 should satisfy nearly everyone. The one niggling issue I sensed was the leisurely upshifting of the transmission, especially noted under hard acceleration. The shift points seem a bit too far apart, something you’ll detect as the engine roars. 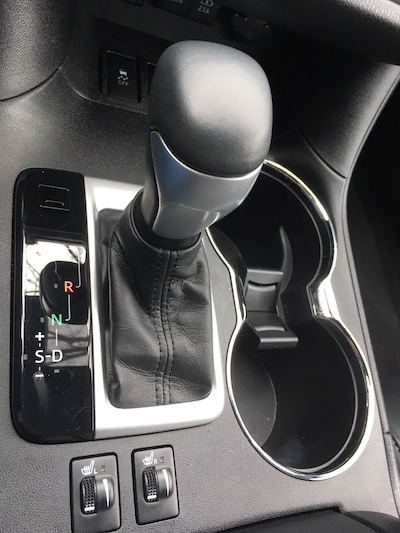 Switching to sport mode and using the paddle shifters eliminates this small issue, but it is something you can’t ignore. As for steering, it is engaging with handling equalling what competing models offer. You’ll notice some body roll as you make turns and that’s not unexpected. The ride is comfortable with even larger bumps swallowed by the chassis. My shopping recommendation with the Highlander is fairly straightforward: choose either the XLE or the SE. You’ll go with the former if you absolutely must have eight-passenger seating or the latter if you like a sporty look. Either way, there is only a nominal price difference between the two. As for the available all-wheel drive, definitely opt for it if winter conditions warrant. It is also a good idea if you tow, supplying an added peace of mind when traveling under a full load. All in all, the 2018 Highlander is the tonic for families who don’t want a minivan, but want strong storage options and the higher profile that goes with it. Toyota Highlander Competitive Set: Mazda CX-9, Kia Sorento, Chevrolet Traverse, Nissan Pathfinder, Buick Enclave, Hyundai Santa Fe, Ford Explorer, Dodge Durango, Volkswagen Atlas, GMC Acadia and the Subaru Ascent. 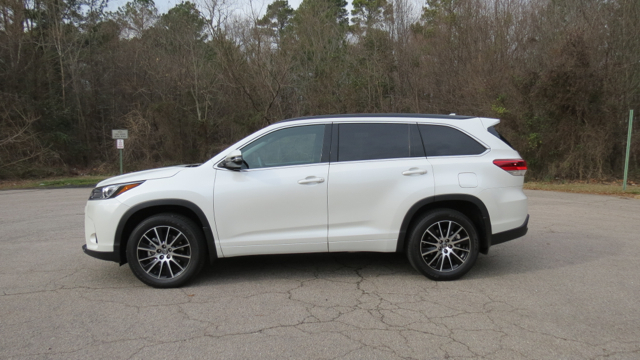 2018 Toyota Highlander photos copyright Auto Trends Magazine. All rights reserved.